Our Vinyl Weighs A Ton - This Is Stones Throw Records. Documentary screening + Peanut Butter Wolf Video DJ set. A must-see for fans of independent hip-hop label Stones Throw Records. 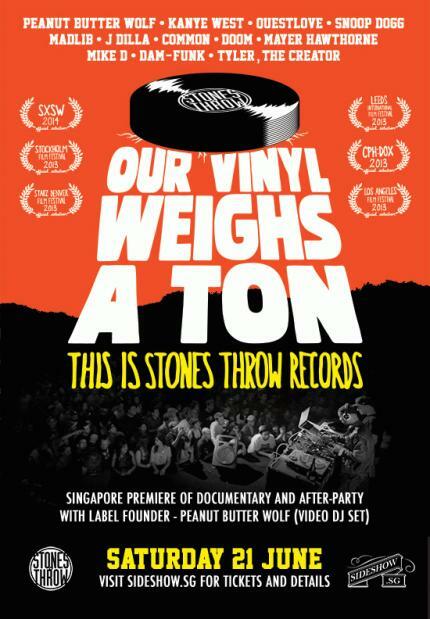 Part One of the Sideshow Stones Throw Records Weekend features the Singapore Premiere of "Our Vinyl Weighs A Ton" and Video DJ set by label founder, Peanut Butter Wolf. Stones Throw merchandise will also be available on the night (cash only). 20.30 - 21:00 Get down early, grab a drink and chope the best seats! 00:00 - 02:00 After-party with Funk Bast*rd (Darker Than Wax). Read on for more information about the film, Stones Throw, and Peanut Butter Wolf. Our Vinyl Weighs A Ton is a feature-length documentary about avant-garde Los Angeles-based record label Stones Throw Records. The film weaves together rare concert footage, never-before-seen archival material, inner-circle home video and photographs and in-depth interviews with the artists who put Stones Throw Records on the map. Our Vinyl Weighs A Ton gives an exclusive look into the label’s left-of-center artists, history, culture, and global following. The film features exclusive interviews with Kanye West, Snoop Dogg, Common, Questlove, Talib Kweli, Mike D (The Beastie Boys), Tyler the Creator, and many more. Under the direction of founder and world-renowned DJ Peanut Butter Wolf, Stones Throw has consistently released critically acclaimed, left-of-center albums since its inception in 1996. The LA-based label is considered one of the leading names in underground hip-hop circles with a cult fan following around the world. Applauded as a risk taking, genre-bending imprint, Stones Throw not only is a top tier tastemaker for hip hop releases, but has built an extraordinary reputation for its soul, electro, disco, and psychedelia releases. Stones Throw Records was founded in 1996 by San Jose-based DJ/Producer Chris Manak (Peanut Butter Wolf) as a means of releasing his now-classic debut album with the late MC Charizma. Since then, Stones Throw has grown into a multigenerational, international powerhouse in the underground music scene. Over the past two decades, Stones Throw has put out over 200 critically acclaimed releases and has launched the careers of world renowned artists such as Aloe Blacc, Mayer Hawthorne, Madlib, J Dilla, J Rocc and many more. Chris Manak first started buying records in San Jose, CA in 1979 at age 9.
violence. Wolf took a break. Stones Throw saw a turning point and defied more conventions with each year. who were rappers at the time to become singers. By taxi/car: Turn into Kampong Bugis from Kallang Road. Follow the road round to the right. Nearest MRT: Lavender. 5-10 mins walk. Access the footpath at the bridge on Crawford St. Small footbridge shown on map is closed.